This page is being updated. Please check back soon! In August 2012, CSEE Professor Dr. Alan Sherman (PI) and Dr. Rick Forno (Co-PI), Graduate Program Director, Cybersecurity, received an NSF grant of $2.5 million over five years to fund 22 students studying Information Assurance (IA) and Cybersecurity. The scholarships are part of the Federal Cyber Scholarship for Service (SFS) program. In 2018, Drs. Sherman and Forno received nearly $5 million for a 5-year renewal grant to expand UMBC’s SFS program enrollment and also build SFS-based matriculation agreements with local community colleges. Future scholars will come from UMBC’s undergraduate, graduate, and professional studies programs. In addition to a generous full-ride scholarship, scholars are granted an annual stipend during their last two or three years. The yearly stipends are $20,000 for underdergraduate, $25,000 for M.S. and $30,000 for PhD students. Students will also engage in paid summer internships with federal government agencies and have opportunities to carry out mentored research projects at UMBC and its cyber partners from government and industry. Launched in 2011, the original Maryland Cyber Challenge was a partnership between UMBC, SAIC/Leidos, the Maryland Department of Business and Economic Development (DBED), the National Cyber Security Alliance (NCSA), and the Technology Council of Maryland (TCM). During its first two years, over 700 competitiors spanning 115 teams participated with more than $160,000 in prizes and internship opportunities awarded to student winners by the National Security Agency (NSA) and SAIC/Leidos. In 2012, the Challenge was incorporated into the CyberMaryland Conference. In its first 5 years over $450,000 in prizes were awarded to student participants. Alan Sherman (PI) and Marc Olano (Co-PI), National Security Agency, $168,743, 2011–2013. Alan Sherman (PI) and Richard Forno (Co-PI), National Security Agency, $85,537, Aug. 2011 – Dec. 2012. In interacting with any secure environment, the user is the weakest link in security. CISA is developing an espionage themed interactive role-playing game targeted for social networking in which players recruit other players, practice sound security practices, and avoid security pitfalls. The project addresses two threats to cyber safety: users act without thinking about the consequences of their actions; and users lack awareness of basic Information Assurance (IA) concepts. This project contributes to the DHS cyber initiative “Stop. Think. Connect.”. Primary objectives include teaching fundamental Information Assurance (IA) concepts to users and expose users to CISSP certification concepts including confidentiality, integrity, availability, authentication, physical security, and personnel security. Auxiliary objectives include enhancing student’s critical thinking and problem-solving skills, and by observing the game development process students will learn about software development. The game will be fielded and tested in Spring 2012 at Meade Senior High School (MHS) in Anne Arundel County as a stand-alone web game accessible via CISA servers. 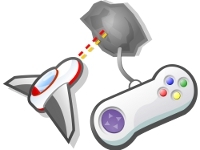 Students will test the game, provide feedback, and suggest improvements for the game.